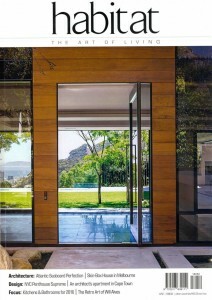 Jenny Mills Architects has been featured (and on the cover) in the new Habitat March/April 2016 with our Avenue Fresnaye Villa project. See below a few snippets from the article or click here to see the article on our website. “It was to be an expression of calm luxury, with modern, clean lines to embrace views and spaces. We used warm, generous materials for grounding and tying together. The manipulation of light quality further enhances the chosen materials. The slated screens create patterns of shade and light and give a sense of softness and tranquillity. One of the major features of the house is the apparent lack of structure. There is in fact an extremely intelligentstructure sitting behind this transparency and seamless integration to the outdoors. Working with Nik Moroff brought the project to life and enabled us to achieve our vision. The landscape design is crucial to the house. We worked at blurring the corners of the property to create links to adjacent views of greenery. This means the eye is drawn outwards and a dynamic set of experiences is created. The landscape filters and frames the sea views. It creates numerous discrete planting experiences as one moves through the house. One of the most powerful of these experiences is the entrance courtyard. We wanted a subliminal connection to memories and experiences.